We are quite fond of potatoes in the Nutmeg Notebook kitchen. 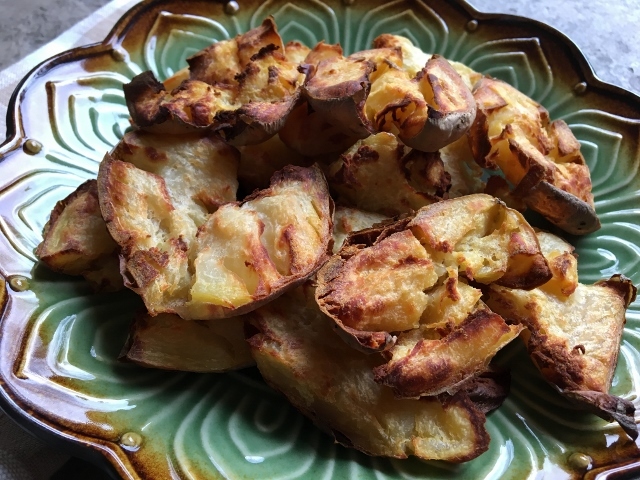 As it often happens I created this method out of necessity in order to use up some cooked Yukon Gold Potatoes that were still in the fridge from the prior weeks batch cooking. They were too small to cut into fries so I came up with a different idea. I smashed them! Hubby Tom declared them to be better than fries! 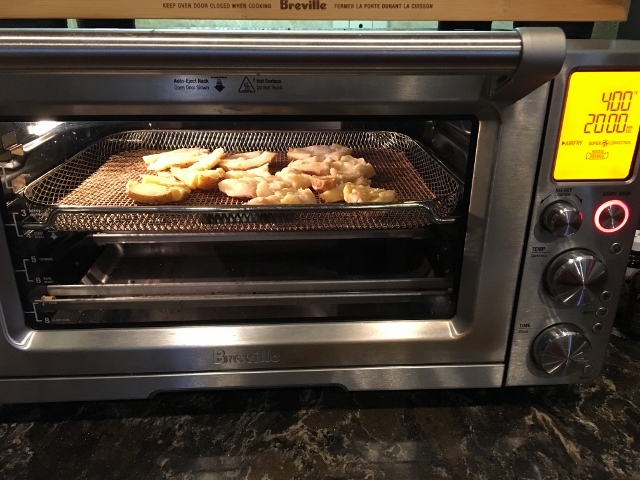 That is really saying something because this guy loves his fries from the Breville Smart Oven Air. This is how Smashed Potatoes were born. 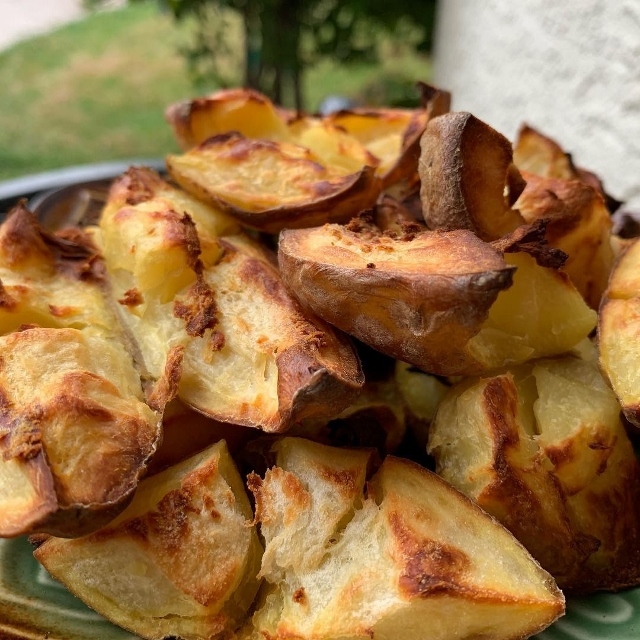 These are the best air fryer potatoes ever! Crunchy on the outside yet steamy hot and moist on the inside. It’s our new favorite way to eat Yukon Gold potatoes. You can try this with other types of potatoes like little red potatoes. I just happen to always buy Yukon Gold potatoes – they are my favorite. We like these even more than fries or the waffle potatoes and they are so easy. Be sure to watch the video to the end to see the outtakes! 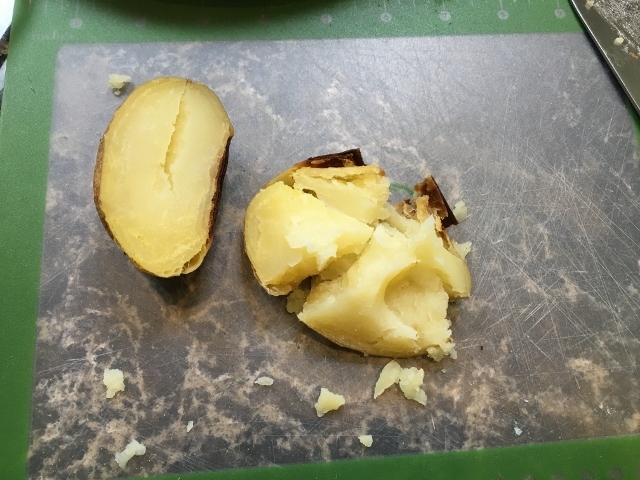 Take previously baked potatoes that are cold from the fridge, cut them in half and using the palm of your hand smash them. You don’t want them to be completely flat – all those nooks and crannies are tasty when they get crispy. Place the smashed potatoes onto the frying rack – skin side down. I don’t preheat my air fryer, I put them in a cold oven and set it to 400 degrees for about 20 minutes. Exactly how long will depend on how big the potatoes are, how much moisture they have and how hot your air fryer gets. Check on them after 15-20 minutes and adjust the time to your liking. 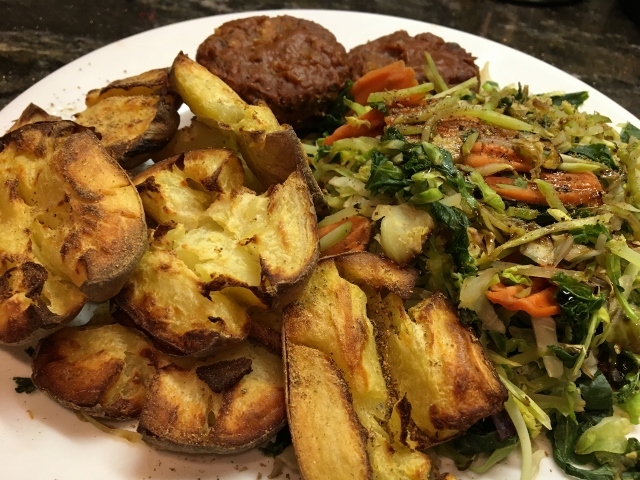 One night I enjoyed smashed potatoes sprinkled with Benson’s Table Tasty, steamed veggies and BBQ Lentil Loaf Muffins. I do find it best to add the seasoning to the potatoes after air frying. If it’s applied before it seems to burn. 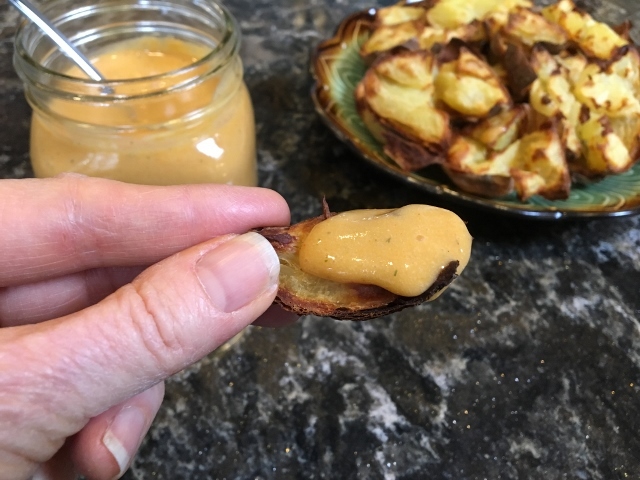 Smashed potatoes are extra special when dipped in some piping hot Donna’s Vegan Cheeze Sauce. Yummilicious! You can never go wrong with a little Homemade Ketchup or BBQ Sauce. They would also be scrumptious covered in Taco Lentils, and Salsa Verde. 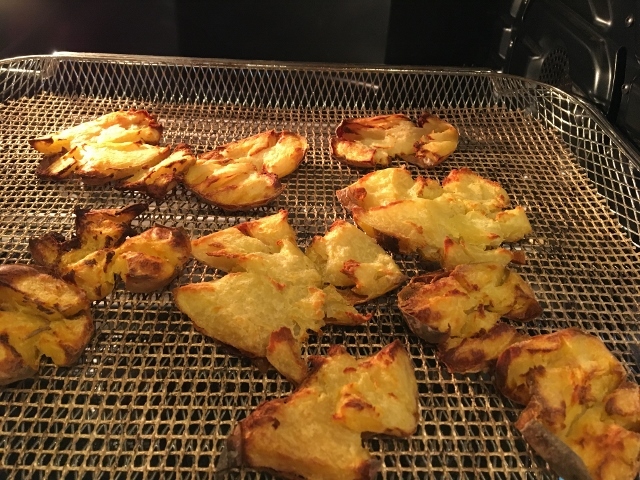 Pre-baked Yukon Gold potatoes – smaller ones are best. 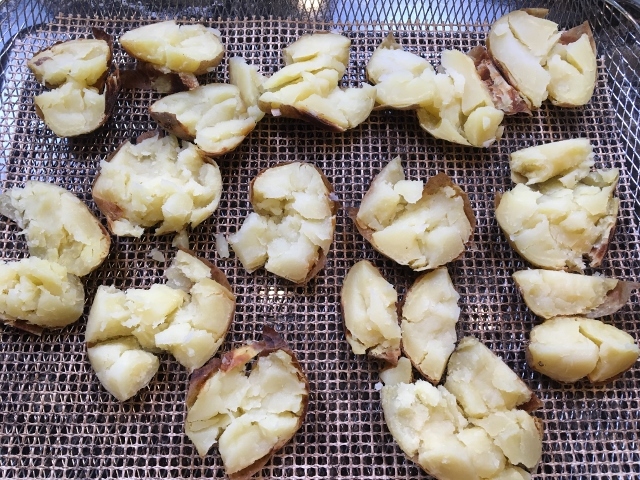 Place the smashed potatoes onto the frying rack – skin side down. I don’t preheat my air fryer, I put them in a cold oven and set it to 400 degrees for about 20 minutes. Exactly how long will depend on how big the potatoes are, how much moisture they have and how hot your air fryer gets. Check on them after 15-20 minutes and adjust the time to your liking. Dip them in your favorite sauce – see the options I listed above. We are also a Holland Bowl Mill Affiliate. They make heirloom quality wood products in the USA. 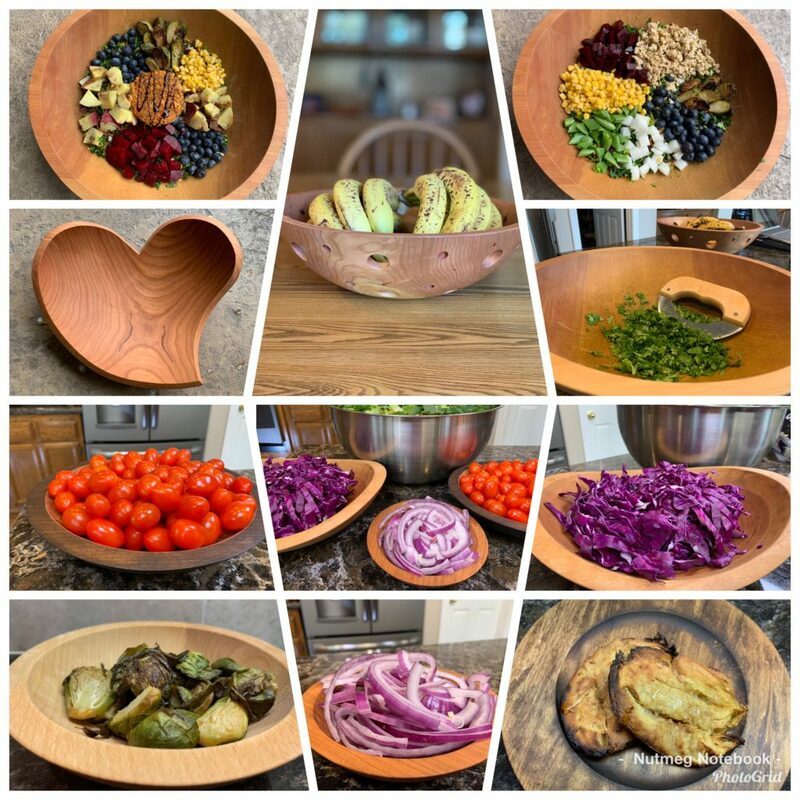 See our blog post and video all about how to make a Chopped Salad in a Holland Bowl and get a free mezzaluna knife with your qualifying order. I agree with your hubby. These are better than fries. My hubby likes them too. I think it’s because they have a little more moisture left in them whereas fried can get a little dry. I made Japanese sweet potatoes the same way as you did on an Instagram post. OMG, they are simply divine, they have amazing notes of caramel. Is this diet similar to the no oil vegan eating promoted by Dr Mcdougal? I follow Chef AJ’s Ultimate Weight Loss Program which is very similar to McDougall’s Maximum Weight Loss Plan which is also a whole food plant based/vegan no oil food plan. It is a low fat plant based food plan with lots of healthy whole starches like rice, potatoes, sweet potatoes, oats, millet, quinoa and so on. It’s a wonderful food plan without weighing and measuring. It’s based on the calorie density chart – eating the lower calorie yet highly nutrient dense plant foods. It’s been a wonderful lifestyle for me!